The artist Bill Greenhalgh creates a wall work for Homerton University Hospital, east London. I filmed this on 16mm film using a Bolex camera. It was shot in Bromley-by-Bow in August 2000 and at Homerton University Hospital in April 2001. Bill was commissioned to make the piece for a corridor at the hospital along which patients were wheeled into and out of theatre. 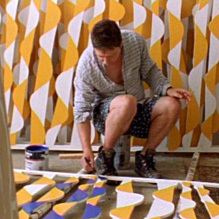 His idea was to make a repetitive pattern piece which would work visually from a patient’s eye point of view. The piece is still in the hospital at the time of writing, March 2013. It’s been rammed by over-zealous hospital porters and wrestled by perturbed patients but it’s proved surprisingly durable.